Property 1: Sandcastle Hideaway, Dog Friendly, Designer Studio, Private Patio And Parking! Property 2: Best Value! Ocean Front/View 133 Great Reviews! Pool Sleeps4 Just Steps to Sand! Charming I BR Apt Pacific Beach, Attached to Ocean Front Home. Property 5: Charming I BR Apt Pacific Beach, Attached to Ocean Front Home. Beautiful TROPICAL OASIS ~ AC*Hot Tub*BIKES*Great PB Location & MORE!!! Property 6: Beautiful TROPICAL OASIS ~ AC*Hot Tub*BIKES*Great PB Location & MORE!!! Spectacular penthouse with views to match!!! Property 7: Spectacular penthouse with views to match!!! Property 10: Amazing confortable Condo! Long term rental. MAY/JUNE SALE OF BAYFRONT ONE BEDROOM SUITE WITH PANORAMIC BEACH AND BAY VIEWS! Property 11: MAY/JUNE SALE OF BAYFRONT ONE BEDROOM SUITE WITH PANORAMIC BEACH AND BAY VIEWS! Newly remodeled, gorgeous, cozy condo with pool view! Great location! Property 16: Newly remodeled, gorgeous, cozy condo with pool view! Great location! 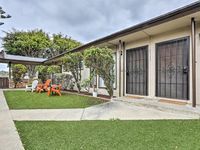 Apt in the Heart of Pacific Beach - 1 Mi to Coast! Property 23: Apt in the Heart of Pacific Beach - 1 Mi to Coast! Diamond Condo(C) - 2bed/2 bath w/AC & Parking! Property 26: Diamond Condo(C) - 2bed/2 bath w/AC & Parking! Oceanfront Pacific Beach Condo W/ Panoramic Beach & Ocean Views! Property 27: Oceanfront Pacific Beach Condo W/ Panoramic Beach & Ocean Views! Property 29: La Jolla Cove Penthouse with Panoramic Ocean Views. On Coast Blvd. Property 36: Oceanfront Luxury Condo!! GREAT LOCATION, 2Br/2Ba, Steps 2 Beach & Bay! Property 38: GREAT LOCATION, 2Br/2Ba, Steps 2 Beach & Bay! 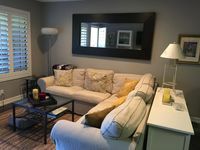 Property 46: La Jolla/UTC, San Diego- Close to UCSD- private, furnished, beautiful room. Nice quite neighborhood. Close to shopping and freeway. Nancy has been very attentive to our concerns. I had a good stay. It was close to restaurants and shops. It was quaint and perfect for a couple. The living room furniture was quite uncomfortable so I can&rsquo;t imagine the pullout bed being comfortable either. It was supplied with the basic needs that one might need. It was pretty clean. I would recommend that the cleaning crew wipe off around the light switches, top of trash can and a few cabinets that showed dirt. I would recommend to a couple.